Natalie Beazer suffered from chronic pain for years. After many unsuccessful attempts to find relief, she booked an appointment with an internist. He thoroughly asked questions and after a comprehensive analysis, she was diagnosed with Fibromyalgia. The disorder causes widespread musculoskeletal pain as well as fatigue and issues with sleep, memory, and mood. But Natalie also struggles with migraines and has chronic fatigue syndrome which further limit her ability to do the daily things she would like. Her life was being affected so much that she was unable to work the hours required by her employer and she had to quit her job as counselor for special needs students at a local college, a job she truly loved. She felt defeated. But then she was matched with Mobility Assist Dog Sydney. “Sydney helped me bounce back quickly,” Natalie says with a smile. 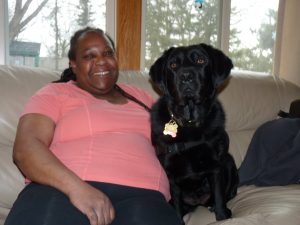 Her mobility significantly improved with the Black Labrador Retriever by her side. Even simple tasks like laundry and walking up and down stairs had became too much for Natalie, but with Sydney she can do these things again. And Sydney has given Natalie’s family peace of mind when her husband is at work and her boys are in school. They see Natalie more self-assured and able to take care of herself. Natalie uses some of the energy Sydney saves her to take the loving pup on walks. “My stamina has increased so Sydney and I can walk for an hour,” Natalie says with pride. Natalie recently was appointed to the board at Lionsgate Academy where she can put her expertise to work again helping children on the Autism spectrum. In addition, she asked herself, “How can I bless other people?” and realized that her hobby of couponing could help others. The extra items she gets through couponing are going towards baskets of goodies she’s donating to local families in need. “I am so thankful—it was like Sydney was made for me,” Natalie exclaims. She credits the volunteers and donors and everyone else who made their union possible. Sydney has improved the quality of Natalie’s life through placing focus less on the pain and more on the joys of living.